Ok. I’m was driven out of my apartment on Wednesday by the roadwork noise. An advantage of living over a major tourist thoroughfare is you can guess how warm it is if you look out. Wednesday’s clothing showed it was cool and I could see up above the neighbouring building that it was overcast and I hoped I didn’t need a rain jacket. 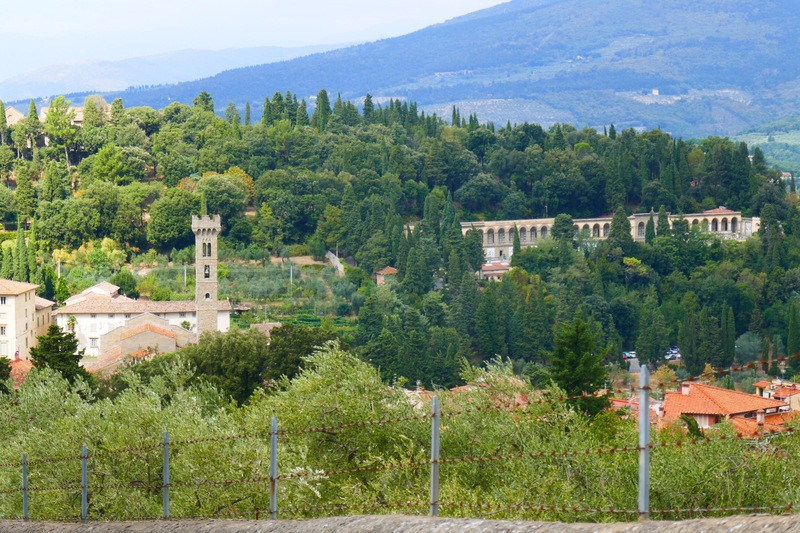 Taking advantage of TonyF’s advice I was heading out, to the nearby hills, to Fiesole. It’s only a few km away. Once, no doubt, a long way away. May have even belonged to someone, such as the Pope, who lived far from Florence. I don’t know. The world is always a very changeable place. No wonder the Spanish hedge their bets about locations. They use the less certain version of ‘to be’ when talking about where something is. Like here, they’ve had millenia to recognise the impermanence of existence of most beings and things! Catch a bus from in Florence, near the San Marco Plaza. I checked it in advance happily as you now catch the bus in a different street to usual, yes, because of roadworks. You buy tickets before and, on the bus, have to validate them in a machine. Oh hasten the day when places all over the world let you buy and validate all tickets through your iPhone. 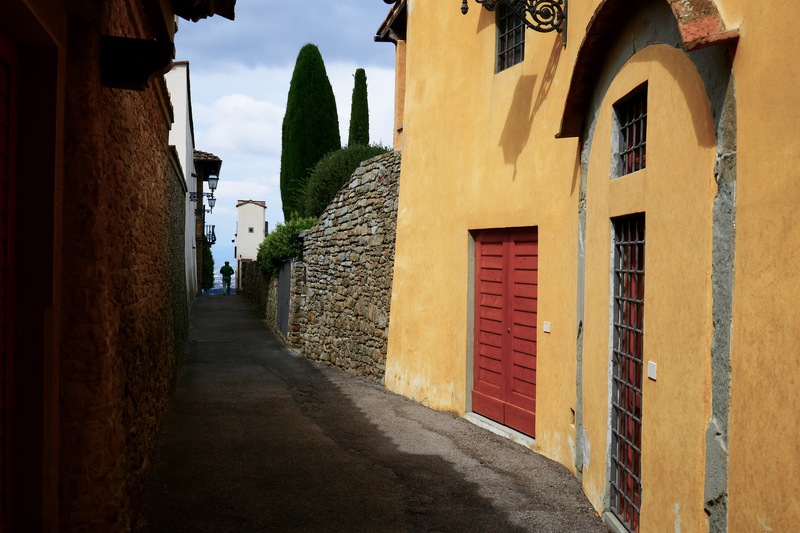 The road heading out of Florence, like most cities, has little to recommend it. Trust me, tourists stick to the older parts of town for a very good reason. 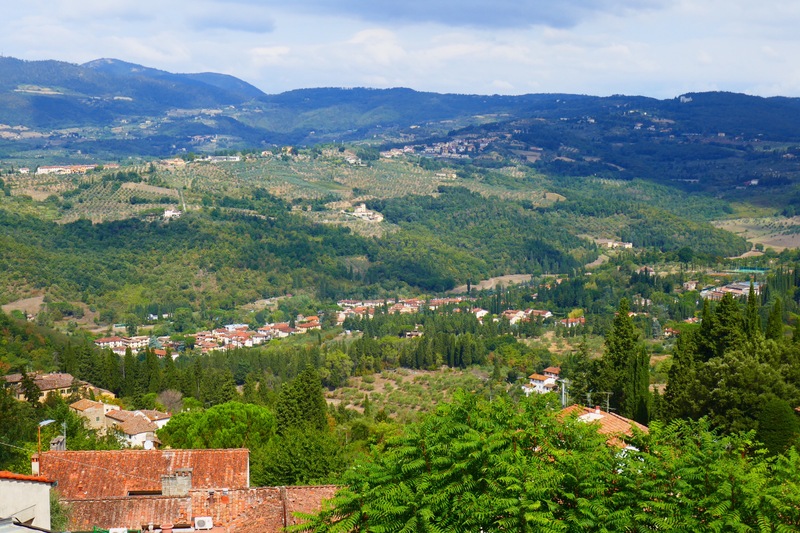 On the bus, suddenly, you can see the hills of Fiesole, and other nearby places. And then you are there. The bus ride is short, around half an hour I think. 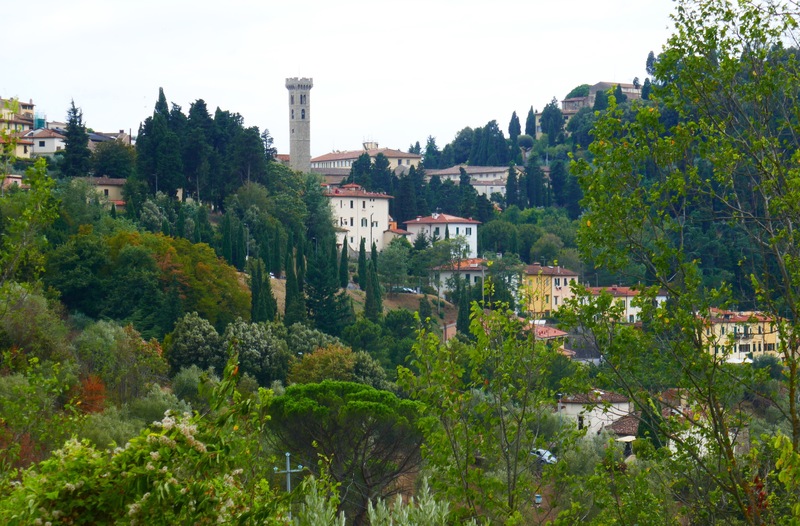 One of the best views for me was looking back up at central Fiesole from a few hundred metres away. 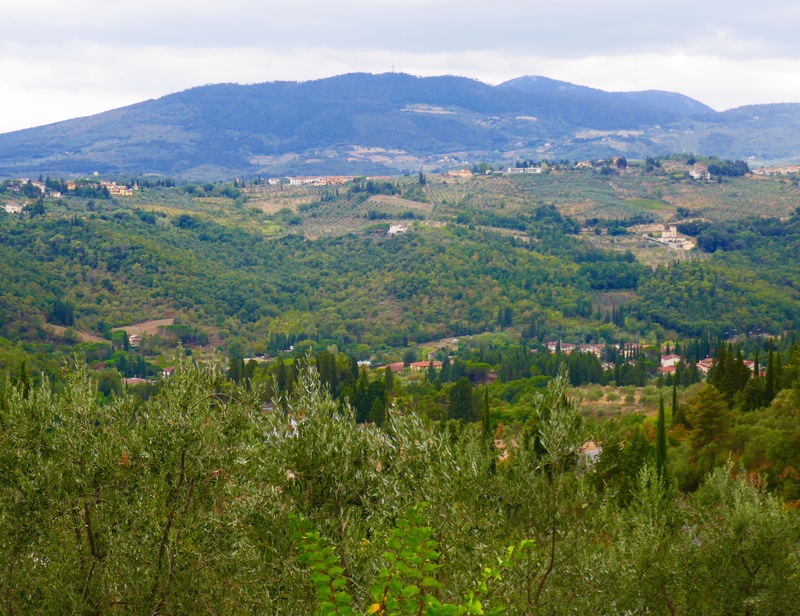 Trees, especially rows of olives and cyprus pines, make for green patches all over the surrounding hills and undulations. Reminds me of bits of Tasmania or NZ but with a hugely bigger population added. I hope those worlds don’t become as crowded as Europe, including Tuscany. Just don’t tell anyone how special they still are. Houses are usually yellow(ish) or white with red roof tiles. 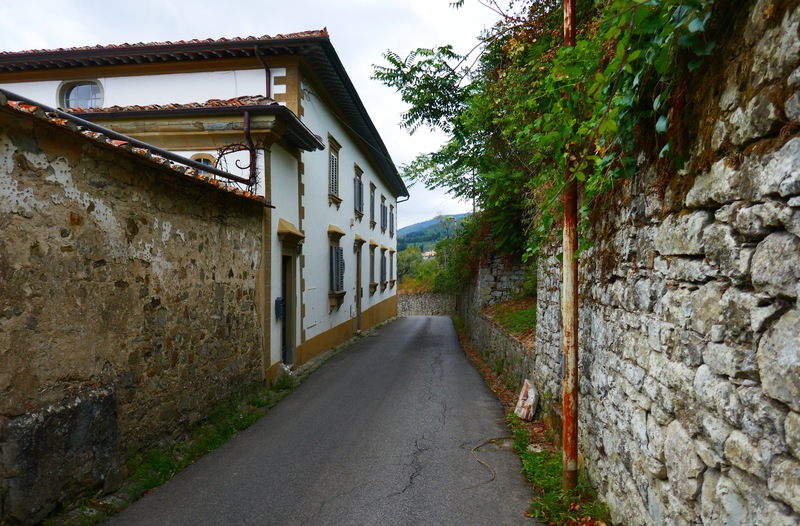 Most have two or more floors and many of the rural ones have outbuildings. I wasn’t too keen on one with its open stairways after I saw a nearby ‘slippery when snowing and raining’ sign. Looks good but….open in winter? External stairs? Brrrr. I love the colours. Everywhere from the houses to their plant boxes. And at the end of one street was a very narrow strange building, about the width of two men standing side by side. It was in the corner of a paddock filled with olive trees. Was it a house or a strange two story um, fully enclosed verandah? Who knows! 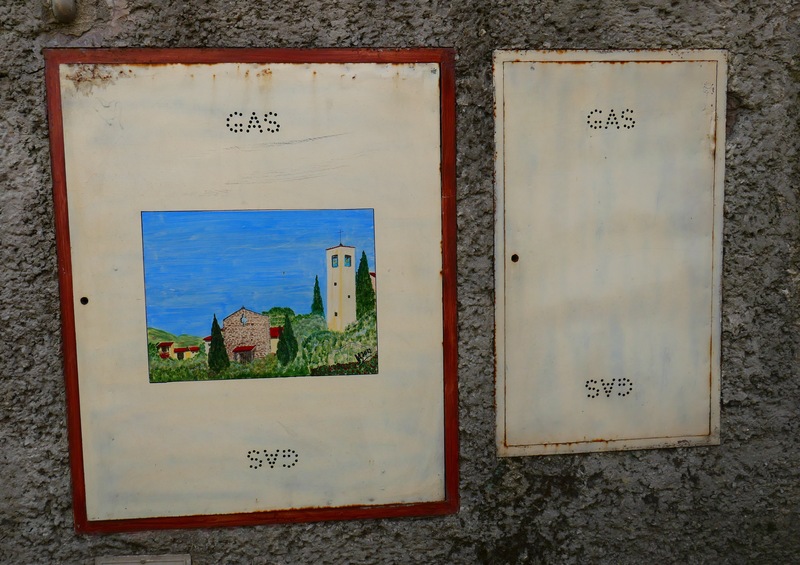 Some of the best sights in Fiesole are the gas boxes. Yes! Many have a house painted on them. The fantasy house of the residents perhaps? People who have unemployed artists as friends? Or just a glorious aesthetic contribution? Whatever, I love them and they are certainly distinctive. Contrast the unpainted version. 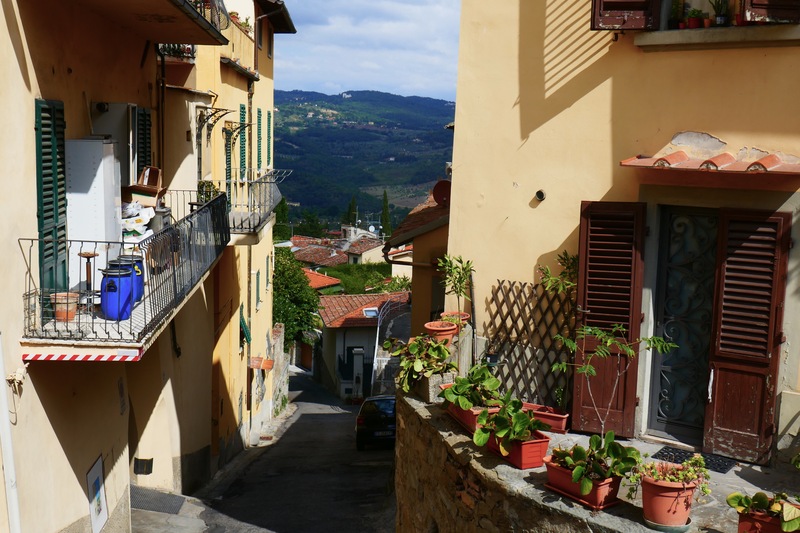 The connecting streets in Fiesole are very narrow, generally one car only width. Many have no space for a footpath even. To make it worse, some locals drive like bats out of hell. Perhaps it’s just that as a pedestrian on a road with insufficient space for even a rudimentary footpath a car coming towards you at even 20km/hour feels scary. Strawberry jam anyone? A couple of times I read that option as my future. Florence, way over in the distance from up here in Fiesole, looks unappealing and busy, if you are silly enough to look back down that way. Anyhow, before starting some of my walks, I had a quick coffee in Fiesole. Thought I had the money figured. I heard one eighty for the coffee but got seventy cents back. Clearly I haven’t got it right. So much for the transliteration of Spanglish with Italian. I think that’s what I did. And love was at a table in the cafe. 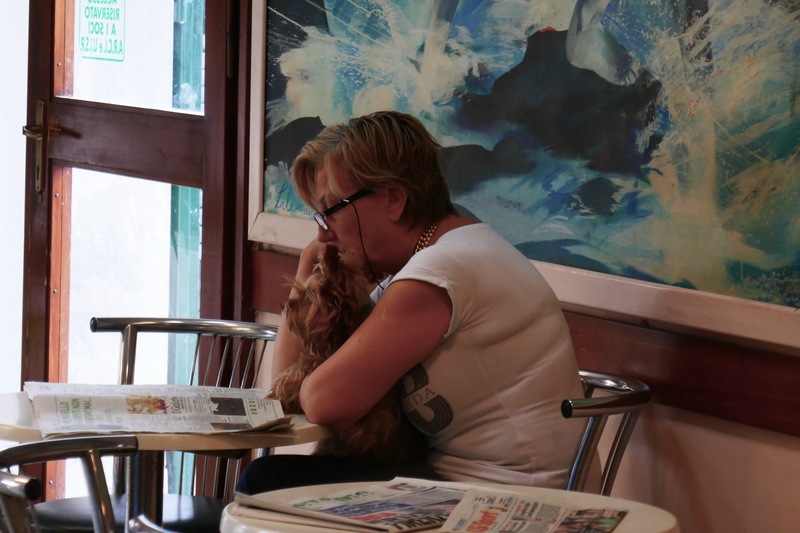 A darling little yorkie possibly with its person. So civilised allowing dogs inside. Yes, I can cope with smokers outside, near the door, when this is allowed. 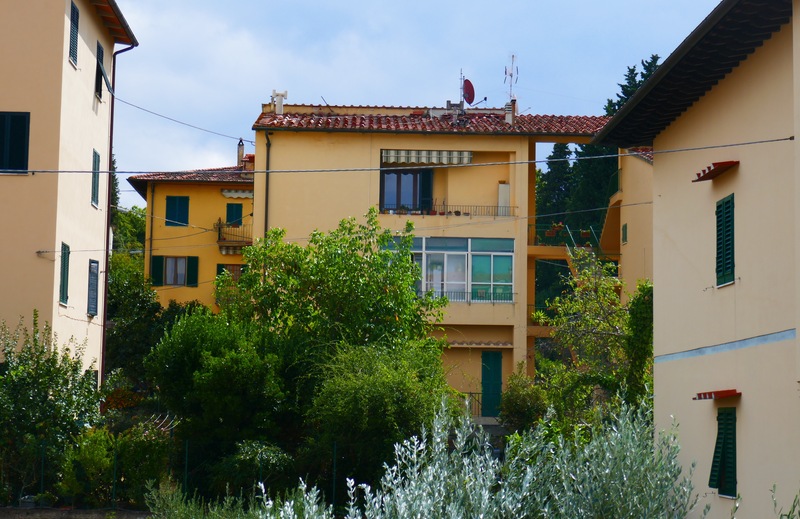 The coffee was great and sitting on an open balcony overlooking a small part of Tuscany is such a pleasure. Again, it’s the green patchwork, the olive trees, the collections of coloured houses with their red tiles. And the rolling hills. No flat spaces to be seen. 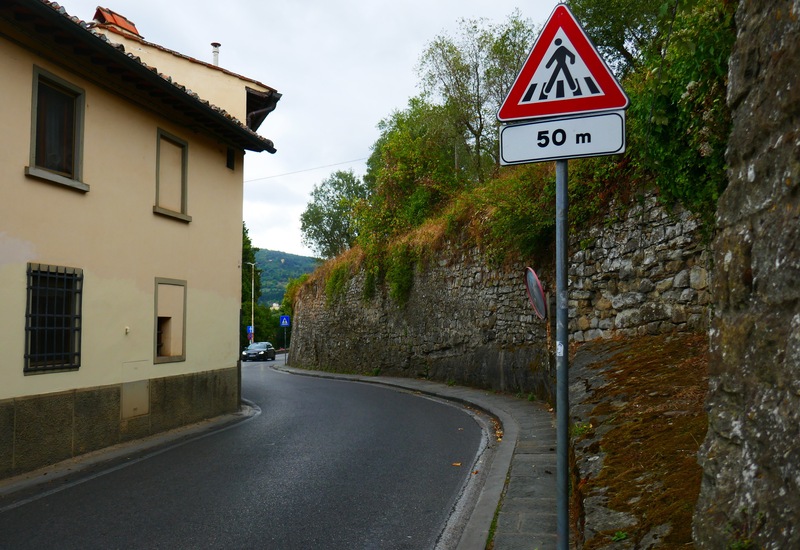 I’m guessing next week’s walks near Lucca will be in areas looking like this but a bit steeper. Who knew! 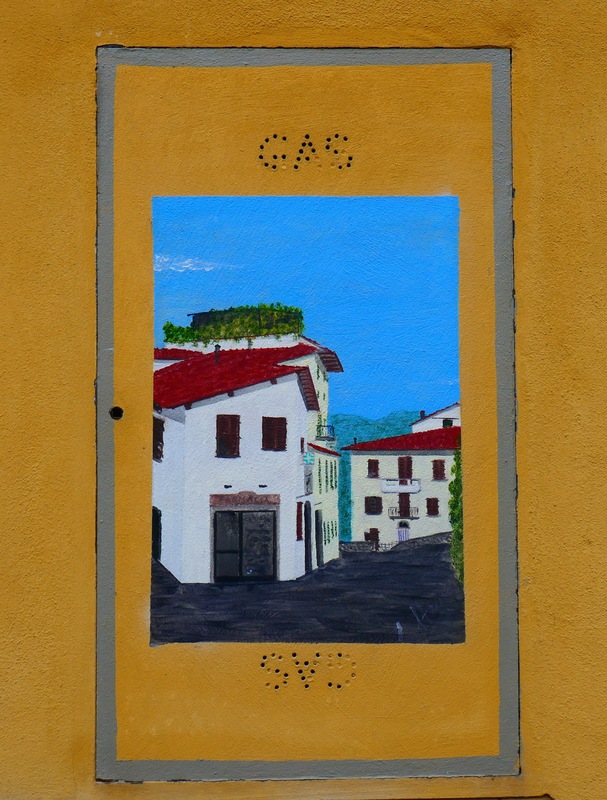 This is where the Etruscans of my reluctantly garnered art history knowledge lived. In those days, in my xenophobic little world, Italy meant little to me and the Etruscans, nothing. Nothing at all and why would I care about the strange containers they’d made and decorated. The tombs confirm they really existed and that they died. A roadside sign led me down a side road and I found the them, next to a busy motor workshop. Not much to see but it’s what the two types represent that’s interesting. 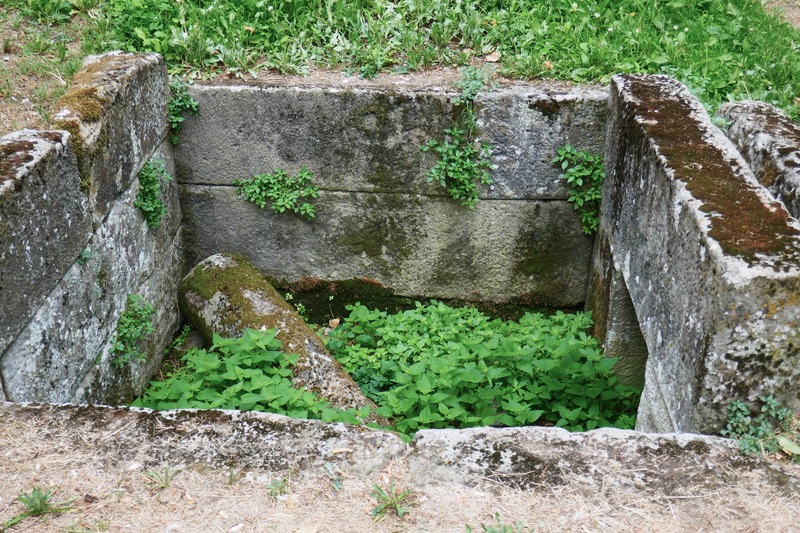 One type is rectangular and above the ground. Imagine the preceding development of this and the social costs in building them. Impressive. 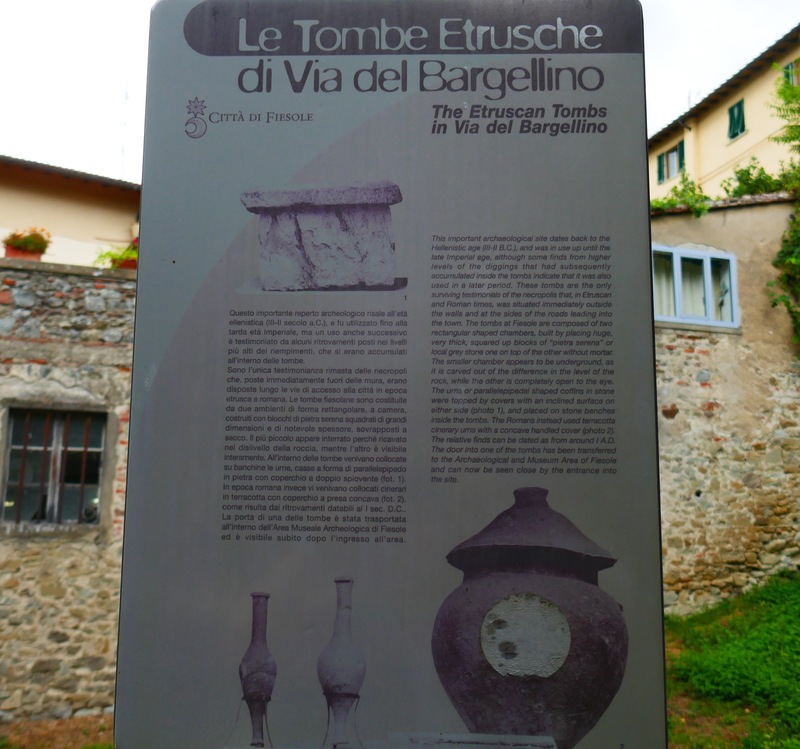 Fiesole has a known history going back a couple of thousand years. And the tombs just remind me that so many people have lived and died here over the millennia and so few of them are remembered today. Yeah. That’s life! 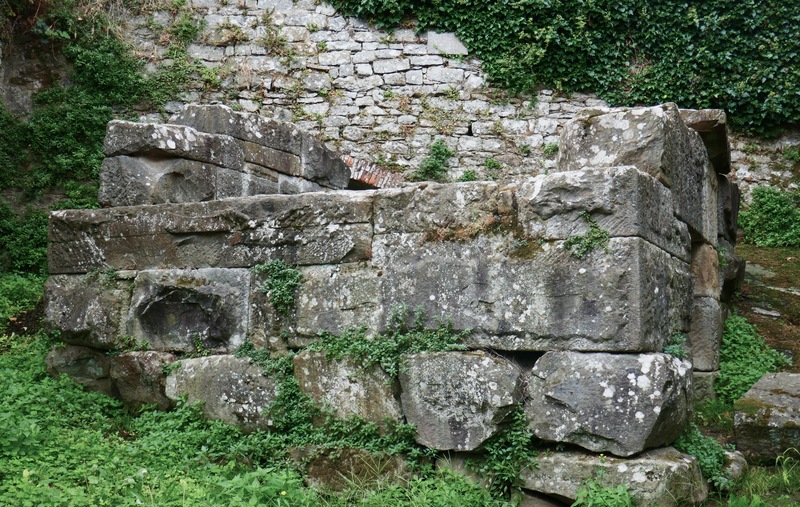 I know but tombs are interesting for what they say of a society. Aren’t they? Thankfully today’s history takes a bigger view of the world and the many histories, and not the narrow sectorial views I was given, the anglophilic version of the universe. 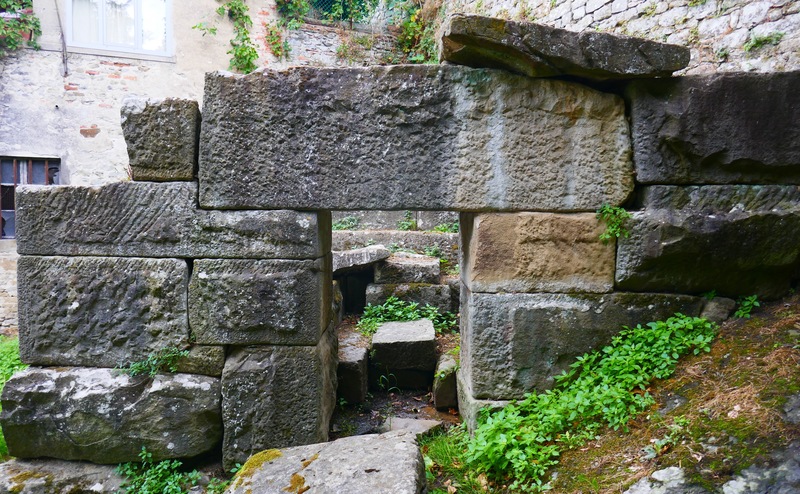 No wonder the Etruscans meant little to me. I still know nothing about them still but, will. And I’m hoping there is a museum here somewhere nearby. If so I’ll break my rules about Florence and museums. And meanwhile rejoice in some of the more recent changes in our world. I stopped at an outdoor restaurant in Fiesole. I was waiting for the waiter and then I realised I didn’t want to eat there. Not really sure why but I didn’t. Waiter arrived as I was leaving and wanted to know why. I said it was too noisy. It was but I could have moved tables. And, just after I got on the nearby bus, I saw a large, blousily dressed local woman chasing out from a restaurant after someone. Yup, it was a family of Aussies. The parents and the four kids were very unhappy about the food, said it was dirty and anyway, they’d paid. She had no choice but to go back into her pizzeria. Needless to say I won’t be eating in either place if I return to Fiesole, as I well might. 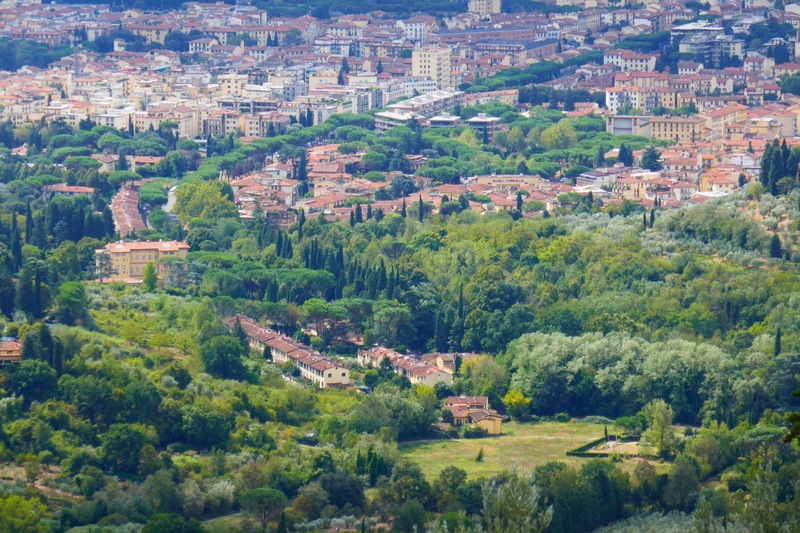 Fiesole has hills to walk. Just a few more days to catch up weeks of fitness lost. Was it worth visiting? Yes, to see the tombs and to be reminded of the durability of settlements here. Yes, to see the views around the place.